I have a page of background to and history of the festival here that contains some Purple content (text and images). Click on the image to the right to read scans of the Music UK magazine Knebworth preview. 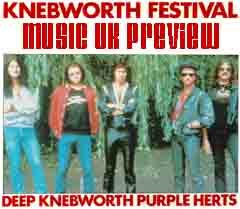 The Return of the Knebworth Fayre proved quite an amazing start to my festival going experiences. 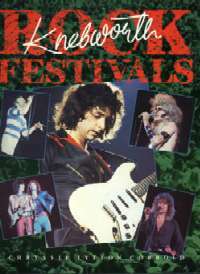 The title referred back half a decade when the site regularly held rock festivals - the likes of Led Zeppelin and Genesis having played during the 1970's. 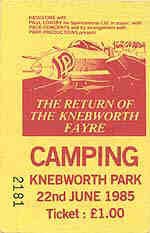 Knebworth House now has a website that has a short feature on the 80s festivals plus to find out more about the history of the festival the owners have a gift shop website which used to sell copies of the useful reference book 'Knebworth Rock Festivals', by Chryssie Lytton Cobbold, November 1985. It appears no longer to be listed so I assume it has now sold out. The 1985 bill may have been slagged off by the press, the audience and the public, but I was looking forward to it. I'd seen only one of the bands on the bill before, Meatloaf, and had never been to a festival. The weather could certainly have been kinder but if I could survive Knebworth then I guess I can survive any festival. I was certainly not new to headliners Deep Purple and the members that passed through their ranks in the late 60's and early to mid 70's; my first gig was Gillan in Aberdeen on the last tour the band did (1982) and the first band I ever went to see twice on a tour was Whitesnake (in 1984) which strangely enough was the last tour Ian Paice and Jon Lord played with the band. Come April that year the reason became clear when Tommy Vance announced the Deep Purple reformation on the Friday Rock Show on Radio 1. Little did I imagine that evening that I would have the chance to see than band - and even further from my mind was the fact that they may play just one UK show and that would be in the middle of a rather large field! The rest of this page recalls my memories of the trip to, and time before the music began at, the Festival. It includes information on the trip Ian Gillan made through the crowd as part of the Friday Rock Show and I believe will give you an idea of the build-up to the music. If you are only interested in the Deep Purple part of the show I suggest you click on the link in the box to the right though on doing so you may miss some out on some of the atmosphere the event generated. The reformation tour began in the last few weeks of 1984 in Australia and followed the sun (as I seem to recall one of the band saying in an interview) round the world before finding themeselves home on almost the longest day of the year in Knebworth, England. Unfortunately the sun wasn't playing the game and only popped out occasionally during the day between heavy showers. Despite this spirits were high in the crowd with most of us bonded by the fact we were either seeing the legend that was Deep Purple for the first time ever or the first time in at least nine years. Of course before our big moment came a lot of travel, water and music. For these pages I'll stick mainly to Purple related memories and a brief rundown of the other acts on the bill. Tickets went on sale several months earlier and adverts also appeared for overseas trips. One of these, to Genk in Belgium, appealed to me for three reasons. Firstly the collection point was outside Knebworth directly after the show so I wouldn't have to worry about getting back to London. Secondly I'd never been abroad and this would give me a good excuse. Finally, at that point nobody had any real idea if the reunion would last (Gillan and Blackmore had a difficult relationship in the early 70s and I don't think many people thought much had changed even ten years down the road. With this in mind the chance of catching a bus directly after the Knebworth show seemed like a good idea even for a poor student (as I was at the time - mainly due to my DP record buying habit) so I booked up. I also filled in details for a passport so imagine my disappointment when the passport arrived around the same time as a letter saying the trip was off due to lack of interest. All was not lost however as it meant the money I saved could be used to spend a few days in London as this trip was the furthest south I'd been in my life. A Uni friend, Chris Fremantle, offered to put myself and another friend, John Stout, up for a few days after the show. With accommodation sorted the three of us boarded the overnight Stagecoach (a Scottish bus company that had started trading a few years earlier and was undercutting the competition - now they run many of the bus companies around the UK and some trains as well) on Thursday the 20th June 1985 for the eleven hour trip to London. After a mainly sleepless night we arrived in London early, if not bright, and Chris navigated us through the London Underground to the Battersea Park area where we would be based. After dropping some of our gear off and freshening up a little it was back into town and a train North towards our goal, Knebworth. Unfortunately our 'local guide' chose to ignore the posters telling us not to get off at Knebworth station so we were the only three that did. The station was marginally closer than the recommended Stevenage (from where all the organised busses to the site departed) but there was no transport available other than shanks pony. Ah well, it was a nice sunny afternoon so off we set in vaguely the right direction (we hoped and we had no map to follow). After some wandering another bunch of lost souls, German and with transport, were daft enough to ask us for directions. Luckily when we said we had a reasonable idea but would have to show them they opened the door to their VW microbus and we were saved a couple of miles hike. Looking back at maps (multimap of the Stevenage/Knebworth site and Knebworth Park itself) it seems that we would have had to navigate to Junction seven of the M1 and then into the park. Even at this point, late afternoon, crowds of people were walking towards the Park and when we eventually arrived at the camping site it seemed to be already fairly full. We'd not brought a tent but the promised general accommodation tents seemed to be lacking. I think there was one largish green marquee type but it was already full (though John may correct me on that). Still the weather was OK and I did have a 6' by 4' plastic groundsheet packed to sit on so we didn't worry too much. As the sun shine we became familiar with the outline of the festival environs things looked promising (apart from the accommodation issue). ... hot and sweaty ride down on a stagecoach. We 3 sat near the front upstairs. Chris pulled out a crossword from a newspaper to pass the time during the night and I chatted away to the girl next to me, only to discover that she was about to enter a convent! You got the bit right about the campsite. As I recall we didn't bring any gear at all with us. We hitched a lift onto the campsite with the Germans in their van - Biker types? I also remember us all trying to get a fire going under a large tree, but then being shunted off by the gamekeepers. I stumbled around the site, eventually clapping eyes on a small caravan. Having knocked politely on the door, and head popped round and the bloke's eyes lit up - first customer of the night! I thought I'd better try and act up the hypothermia bit just to be convincing, but as it turned out I didn't have to act too hard, given the Red Cross bloke's diagnosis. I was all for going back to find Doug and Chris, but oh no, the bloke insisted that I was in no condition to go back out there! Instead, I was led off to a big marquee outside the arena where I couldn't believe my eyes.....a dry bed for the night. Not only that, but I woke next morning to the smell of a cooked breakfast! The bloke even got me back past the security guards and back into the arena without a ticket. Chris and I stayed on the slope until the end of Blackfoot, I think. I remember being nearer the front for UFO and Meat Loaf (being next to the ML fans who clearly were too refined for a rock bash like this one), and the Scorps. Unlike the other support acts, the Scorps dispensed with a Radio 1 DJ introduction, and literally exploded onto the stage with 'Blackout' (as opposed to Coming Home which was the set opener for the rest of that tour). I was at the front for the first 3 DP songs, and then gave up and worked my way to the back - memories of moving between the sound towers to the surround sound antics of Blackmore's guitar antics during 'Truckin'. The crowds were so big at the end that Brian missed his bus home. Chris and I joined the mud-covered crowd slowly snaking along from site to station, in single file - it took bloody ages. And then when we got to the station we thought 'Oh, Doug's not here...' and fell onto the next train. Actually, we were amazed that you made it all the way back to Battersea - wasn't it your first time in London? . With time to fill I left the other two to see if I could meet up with a guy I knew from my then local The Moorings in Aberdeen. He was a veteran of at least the Led Zeppelin Knebworth experience and was hitch hiking down. I knew he was being dropped off at Junction 7 so I walked back against the slowly moving cars, some already stuck in the soft ground where they had tried to cut off corners, others with resigned drivers blaring out their Purple tape of choice. The atmosphere, and anticipation, was already building and this was more than twenty-four hours before Purple were due onstage. After waiting forty-five minutes with no sign I decided that his e.t.a. was very dependant on luck and as I could wait anywhere between minutes and hour decided to head back to the campsite. On the way I passed what was probably an only just open merchandise stall and bought probably one of the first programmes on sale at around 7.30pm. I knew that Ian Gillan was due to go walkabout the that evening as part of the Friday rock show build-up and decided a programme was a sensible thing to buy and get signed. Quite how I thought I was going to get it home safely afterwards I don't now but I did and it is still in pretty good shape. I've forgotten how we filled the evening but I guess food, a beer or two and chat about music and what we expected of the following day filled the evening until at around ten thirty the man himself appeared and was soon surrounded by a crowd of enthusiastic fans. The initial congregation began at the low point of a dip between the arena entrance and the road above the campsite. This positioning meant the BBC mobile radio backpack could not connect to the broadcast van elsewhere on the site and almost certainly safely positioned in the backstage area on the other side of the summit. The fun then really began as this growing crowd of radio crew, fans and the object of their attention slowly navigated their way up the damp hillside winding between tents and falling over guy lines. Various stops were made and I think the first chat with Ian was about halfway up the hill though this was only a brief "hello" to the radio listeners. the signal was still deemed low and the summit was headed for as the drunk, sleeping or otherwise engaged inhabitants went about their noisy way oblivious that the bloke singing on the tapes they were playing had just walked past them. The rain had started by now and with a decent signal attained Gillan stopped and chatted with the crowd explaining that he wanted to get a few of us on air to say where we'd come from for the event. Just as he was about to go live the BBC man dropped or had jostled from his hand the microphone and somehow it landed safely in my palm. I guess in a way this was my first interview with the man even though the only part I had in it was holding the microphone. I would have been the next person interviewed (and the furthest travelled judging by those before me) had the section not been cut short and Tommy Vance playing another record. Maybe the BBC boys had been worried by the less than perfect microphone skill I showed. Looking back I should have disconnected the head section and kept it as a souvenir but I was a nice lad and just handed it back to the person it belonged to. (This little escapade gave me an idea for a nom de plume on the local Northsound (Aberdeen Independent radio) radio show after the summer where everybody else used odd names, Heavy Metal Hamster being Mr Stout while I became Ian Gillan's Mobile Mike Stand). With that Ian headed back to the dry studio and better quality technicians and we were left with a dilemma, our half hour adventure had finished and now we had a long night to survive with no tent, rain coming down and only trees for cover. We split up to see if we could find anywhere that was free and had some degree of shelter but on regrouping nothing particularly had been found. Somebody then said the gates had opened and so we decided getting wet inside the arena was no worse than outside and in we went. I guess we were within the first half dozen inside the vast slope that within twelve hours would hold 50,000 people and by the time Purple came on anywhere between 70 and 80,000 depending on which reports you believe..
As you've probably guessed there was even less cover in the arena though we had almost complete run of it. After a scout around we found a couple of large sheets of polythene, one of which already had other people under it. The other, close to the mixer desk tower, we managed to grab briefly until people collecting the sheet as rubbish (if I remember correctly) evicted us. With our cower gone it was down to three of us sitting on one end of the groundsheet and pulling the other end over our heads. Needless to say this wasn't very satisfactory and even with waterproof trousers and a rubberised yellow jacket above normal clothing it was still cold and damp. Mountain supported Deep Purple on further european shows and the Rockpalast recorded and broadcast one of them. Find out more here: http://www.rockpalastarchiv.de/concert/mountain.html. Of course three weeks later there was a much more famous outdoor live event and it had much more luck in the weather department, Live Aid. While it would have been nice to have been there for a few of the bands I think a wet Knebworth was experience enough for one year. Almost* the entire event was recorded by the BBC with sections broadcast live, the following Saturday and through the night in 4th November of 1985 on The Friday Rock Show. My original intention was to cover the whole festival in one go but Tim has already beaten me to it here. The most informative DP site the Highway Star also has views and reviews. * The Scorpions set was never broadcast (and probably not recorded) as they had just released 'World Wide Live' on double LP (video and CD followed) and the setlist was very similar. Here you will find a couple of audience pictures of the crowd and stage, rain and shine care of Charlie. This page is Copyright © Doug Anderson 2000 - 2003. Created: 22 June, 2002. Last updated: 16 October, 2007.